Here is a very simple electronic circuit project of digital to analog converter circuit diagram to build very easy. Figure A is an R/2R resistor ladder. Each switch that is closed increases the amount of current at. A simple channel A/D converter is shown in Fig. B. The voltage reference (D2) is common to all channels, but-the value of the dropping resistor (R9) varies as the number of DACs installed in the system. IC15 is a DAC0808 A/D converter chip. 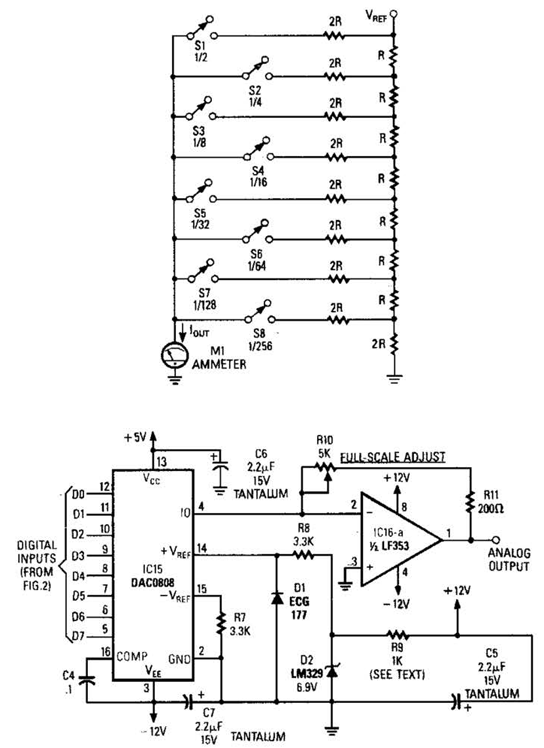 ICI6A is an op amp to interface the output current from the D/A convert to an analog voltage output.